Your performance review is due by 11:59 PM on Monday, May 8. There is no grace period. If you do not submit your report on time (or do not submit it at all), you earn a zero for participation in the course. Be sure that the file for your project includes your completion report. No cover memo is necessary. Go to our course in Canvas, and choose Assignments from the left sidebar. Choose the "Final Exam" assignment. Click the Choose File button, and navigate to your file. It must be a *.doc, *.docx, or *.pdf file. 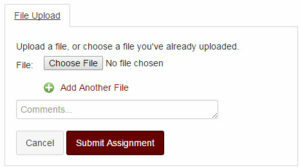 Click the Submit Assignment button, and your work will be uploaded and turned in.